Located on a block of land between Catalpa, Curve, Olive, and Branch streets, Lott Pocket Park shows that park size does not matter. 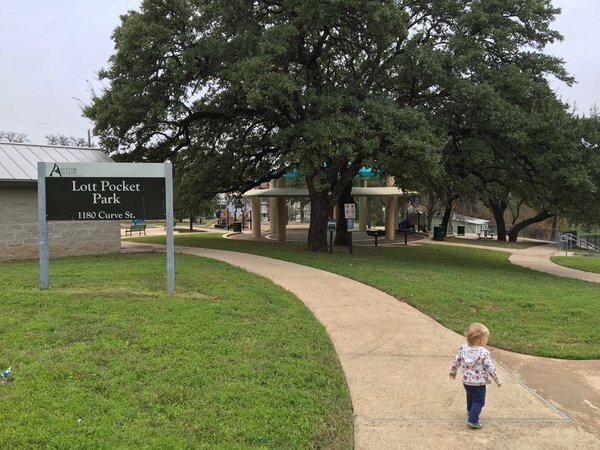 While Lott Pocket Park may be small, it is mighty with amenities that make it a popular spot in the community. One of the main attractions of the park is the splash pad. This splash pad gives the community the perfect place to cool off during the hot summer months. In addition to the splash pad, Lott Pocket Park offers features that everyone can enjoy. These features include a playground, basketball court, a grill for cookouts, picnic table, and large shaded patio. While this park is full of great features, it is still unadopted. The Adopt-A-Park program aims to bring a sense of community to all neighborhood parks. Through a partnership between Austin Parks Foundation (APF) and the Austin Parks and Recreation Department (PARD), the program helps groups within the community raise awareness for the park, and help improve and maintain it through volunteer events and grants. Adopt-A-Park groups benefit from access to APF’s tool warehouse, educational opportunities, and ACL Music Festival Grants. If you are interested in adopting this park, please reach out to our Outreach Coordinator & Community Organizer, Cynthia Rodriguez. For more information, check out the Adopt-A-Park page, and read over the handbook linked there.